GrandMaster Roman is the worlds top players against computers. 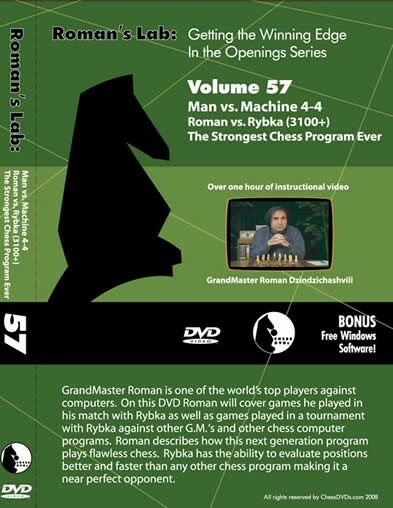 On this dvd Roman will cover games he played in his Match with Rybka as well as playing in a tournament with Rybka against other G.M. "s and chess computer programs. Roman describes how this next generation program plays Flawless chess. Rybka has the abiltiy to evaluate positions better and faster than any other chess program. making it a near perfect opponent. Man vs. Machine (4-4) 2 Wins 2 Draws 2 Losses Roman vs. Rybka (rated 3100+) The Strongest Chess Program ever GrandMaster Roman is the worlds top players against computers. On this dvd Roman will cover games he played in his Match with Rybka as well as playing in a tournament with Rybka against other G.M. "s and chess computer programs. Roman describes how this next generation program plays Flawless chess. Rybka has the abiltiy to evaluate positions better and faster than any other chess program. making it a near perfect opponent.